Continuing my discussion on open source software "desktops" and usability, I previously mentioned the usability of Fedora 18 and the GNOME desktop. In testing the release of Fedora "19-alpha" (they released "19-beta" today), I'm somewhat concerned that GNOME 3.8 (in Fedora "19-alpha") does not meet two of the four themes of successful usability: "Consistency" and "Menus". The updated file manager (Nautilus) doesn't have a traditional menu, but other programs in GNOME 3.8 do. And when you maximize a Nautilus window, either to the full screen or to half of the screen, the title bar disappears. In the interests of making a comparison, I decided to look elsewhere. I tried one of Fedora's alternate desktop distributions: Fedora Xfce. Xfce provides a desktop experience that most users will find familiar. While I haven't done a formal usability study of Xfce, my initial evaluation is that Xfce meets all four of the key themes: Familiarity, Consistency, Menus, and Obviousness. The menus are there, and everything is consistent. The default Xfce uses a theme that is familiar to most users, and actions are obvious. Sure, a few areas still need some polish (like the Applications menu, and some icons) but Xfce already seems better than GNOME. Additionally, if you are technically capable, you can dramatically modify the appearance of Xfce to make it look and act according to your preferences. At home, I've modified my Xfce desktop to something similar to Google's Chromebook. It works really well and I find it is even easier to use than the default Xfce desktop. 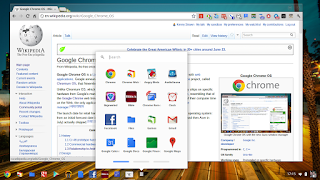 The Chromebook uses a desktop environment called "Aura." 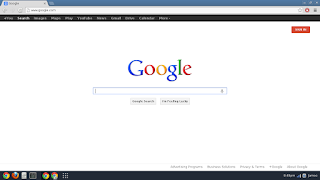 It presents a somewhat simplified desktop experience, where all applications actually run "inside" the Chrome web browser. 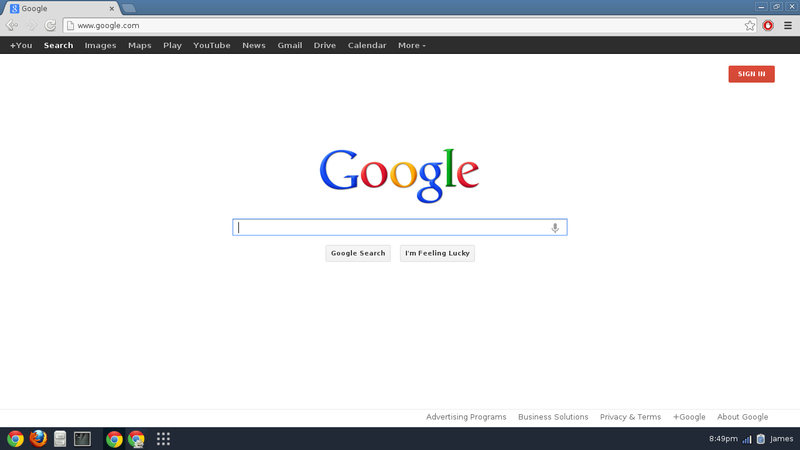 For example, clicking a "YouTube" icon actually launches youtube.com in a new Chrome browser. Frequently-used programs can be added to the desktop, or you can browse other applications by clicking the Applications menu icon. Other desktop functions (clock, wireless network connections, battery indicator, etc) are displayed in the lower-right corner. While there is no "bar" or "panel" like in Windows or MacOSX, the Aura desktop appears to do the same by the way it displays icons and desktop functions. Additionally, if you are technically capable, you can dramatically modify the appearance of Xfce to make it look and act according to your preferences. I've modified my Xfce desktop to something similar to the Aura desktop. It works really well and I find it is even easier to use than the default Xfce desktop. Like Aura, this Xfce desktop uses a "panel" that makes it easy to run frequently-used programs, or you can browse other applications by clicking the Applications menu icon. Other desktop functions are in the lower-right corner. By adopting an available theme included in Xfce, the "panel" visually becomes part of the background, rather than competing for foreground attention, so it is not distracting. Icons aren't so widely spaced in Xfce as they are in Aura—but I only intended a similar feel, not identical. I'll share the steps to reproduce this desktop very soon, for those who are interested. In case you're curious, "XFCE" used to stand for "XForms Common Environment," where "common environment" was an older Unix term that we call a "desktop" today. But it's been re-written twice, so now doesn't use XForms. The name stuck, however, so now they write the name as "Xfce." And "GNOME" originally was the "GNU Network Object Model Environment," but these days it's just written "GNOME," in all caps. I installed Fedora 19alpha on my laptop the other day, and I have to say that Fedora Linux has really lost me. Fedora 19 will include GNOME 3.8 as the graphical desktop, and I've previously noted that GNOME 3 has a few usability issues. GNOME 3 fails to meet two of the four themes of successful usability: "Consistency" and "Menus". Where are the menus? There is no "File" menu that allows me to do operations on files. There is no "Help" menu that I can use when I get stuck. The updated file manager (Nautilus) doesn't have a menu, but other programs in GNOME 3 do. The Gedit text editor (which is also part of GNOME) still has menus, but the file manager does not. When you maximize a Nautilus window, either to the full screen or to half of the screen, the title bar disappears. I don't understand why. The programs do not act consistently. I will give a positive comment that the updated file manager now makes it easier to connect to a remote server. This used to be an obvious action under the "File" menu, but in GNOME 3 it is an action directly inside the navigation area. So that's a step in the right direction. While some areas of the Fedora 19alpha desktop seem familiar, the environment contains many areas where I was left confused. Programs act differently; there's very little consistency. And the updated desktop environment seems to avoid traditional "desktop" conventions. But the biggest problem is the Fedora 19alpha installer itself. Fedora used to have a very simple, easy-to-use installer. You answered a few simple questions using point-and-click or drop-down menus, then the installer did everything else for you. In the Fedora 19alpha installer, everything has changed. (Actually, I believe this changed in Fedora 18.) The installer now presents a yellow warning label that the disk doesn't have enough room. When I clicked into the disk setup tool, I was given the option to "reclaim" space, but I really didn't understand what that meant. There was no button or other option to "install over my previous Linux installation," despite the fact that this laptop only had Linux on it (an older Fedora 17 install). If I were a user with "typical" knowledge and "average" skill, I would likely be afraid to use this installer, lest it do the wrong thing. The installer's progress bar is equally confusing. Usually, when a program displays a progress bar and a message to indicate the percent complete (such as, "Installing … 50%") you might expect the progress bar to indicate the same "percent complete" as the text message. Not so during the Fedora 19alpha installation. The installer (Anaconda) displayed a message that it was installing system software, and it was "50%" complete, yet the progress bar displayed something like two-thirds complete. I quickly decided not to trust the progress bar. And it's a bad sign when your users decide not to trust your software. I think Fedora has lost me as a user. While I am a big Linux fan, and a long-time Fedora Linux user, maybe I'll try something else. Perhaps Ubuntu Linux or Linux Mint will be a better Linux distribution. I'll investigate, and comment on their usability later. A huge part of usability is readability. So it's obvious to me that how fonts are displayed on-screen is an important component of software usability - both for traditional "proprietary" programs and open source software. Imagine my excitement when I read about Google's Open Source Blog announcement of the improved "CFF" font engine, used for rendering on a variety of platforms including Android, Chrome OS, Linux, iOS, and many versions of Unix. Compact Font Format (CFF) is a descendant of the PostScript font format developed by Adobe. The FreeType open source software displays fonts, and the new Adobe CFF engine brings high quality font display to FreeType. Check out the samples on the Google blog to see comparisons with the new Adobe CFF display. The new CFF produces more even blackness of text, fewer "smudges" or "blobs" within the text, more even and consistent character heights, and fewer "dropouts." I'm looking forward to seeing this used in open source software projects, to improve open source software usability.